Wikileaks founder Julian Assange still resides inside the Ecuadorian embassy in London (for now, at least), where he is safe from arrest and likely extradition to the US. But in a Wednesday press conference, Wikileaks revealed that it has obtained evidence that Assange has been the subject of an "extensive spying operation" carried out by the Ecuadorian government, as the feud between Assange and Ecuadorian President Lenin Moreno continues to escalate. 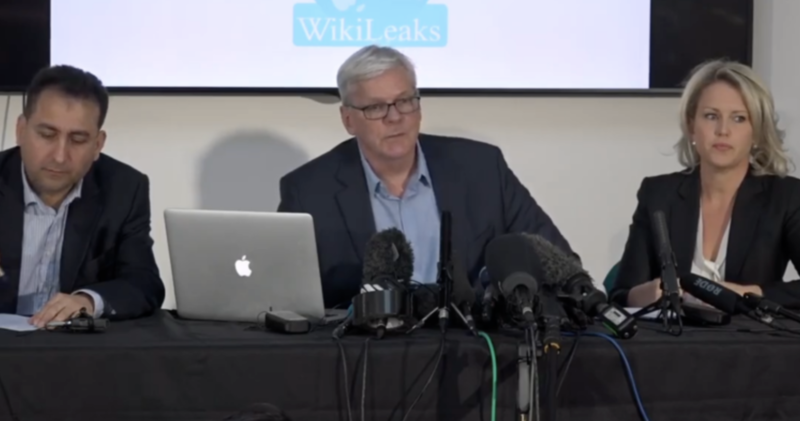 WikiLeaks Editor-in-Chief Kristinn Hrafnsson claimed during an explosive Wednesday press conference that he believes the embassy has handed over footage from its security cameras, visitors logs and even Assange's lawyers' notes to the US, which has indicted Assange on charges related to the publication of classified military and diplomatic documents leaked by Wikileaks. The pretext for the spying is to find a way to end Assange's asylum. "We know that there was a request to hand over visitor's logs from the embassy and video recordings from within the security cameras in the embassy,” Hrafnsson said. The embassy's cameras are capable of recording audio, meaning that every single meeting between Assange and his doctors and lawyers has been recorded, and may have been turned over the Trump Administration, according to former Consul of Ecuador to London, Fidel Narvaez. "Ecuador is not protecting Julian anymore," Narvaez said during the press conference. In fact, he said, Moreno's government has beeen doing everything in its power to try and end Asssange's asylum. Moreno has repeatedly accused Assange of violating the terms of his asylum, most recently by publishing allegations of corruption. "I am told that the ringleader has a prior conviction on similar charges...there is a possibility that this one person was not Spanish but Spanish-Speaking," Hrafnsson said of the extortion conspirators. Narvaez claimed that Moreno is using the Assange debacle as a smokescreen to distract from a corruption scandal involving himself and his family. To try and justify expelling Assange from the embassy, the government is trying to convince the world that Assange hacked Moreno's phone (Wikileaks recently published messages revealing his involvement in a major offshore tax-evasion scandal). Assange has had only limited access to the Internet, and furthermore, no evidence has been produced to substantiate the allegations. Recently, Assange claimed that he wasn't safe in the embassy, and that there have been multiple attempts to break in, presumably by would-be assassins . UK police have typically taken hours to respond to reports of intrusions, despite the fact that a police precinct is located just two minutes away. Despite Ecuador's denials, it's looking increasingly likely that, one way or another, Moreno will find a way to oust him from the embassy once and for all, leaving him vulnerable to prosecution in the US.